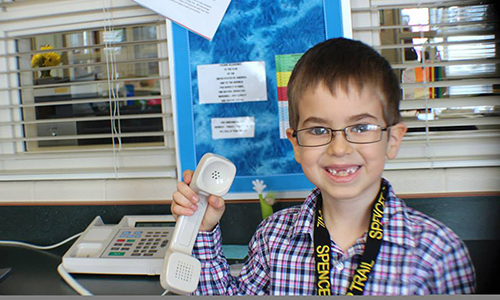 Want to be your school’s principal for a day? Here’s your chance! The NLSD122 Foundation will be sponsoring this unique leadership opportunity for our PreK-6th grade students. All money raised will go towards the Foundation’s Teacher Grant program which directly impacts NLSD122 students. To participate, fill in the tickets on the event sheet and return them to your child’s school. Every student may submit the one free entry found on the event sheet sent home to your child. If you have a PTO calendar, you can find a ticket there as well. Each additional entry is $1. There is no requirement to participate. You can enter as many times as you like during the event dates. On the final day of the event, one student from each school will be randomly selected to become this year’s Principal for a Day. 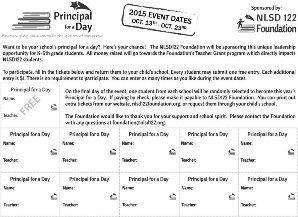 If paying by check, please make it payable to NLSD122 Foundation. You can print out extra tickets here or request them through your child’s school. The Foundation would like to thank you for your support and school spirit. Please contact the Foundation with any questions at foundation@nlsd122.org.